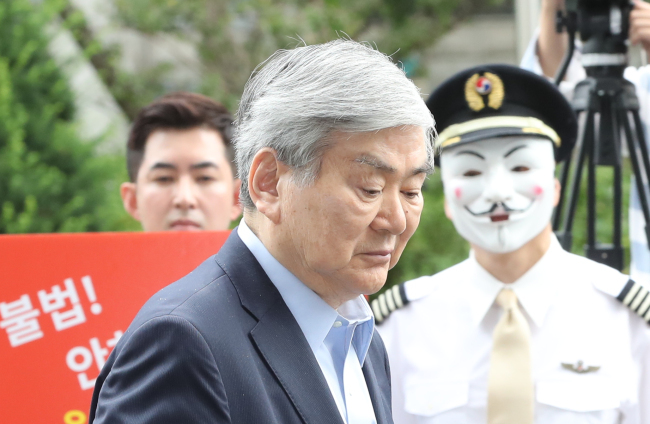 Sullen and quiet, Korean Air and Hanjin Group Chairman Cho Yang-ho on Thursday stood on what has now become a familiar spot for his family: a marker on the ground in front of the prosecution’s office before dozens of flashing cameras. “I’m sorry. I will tell everything to the prosecution,” the 69-year-old chairman told swarms of reporters in front of the Seoul Southern District Prosecutors’ Office. He was the fourth member of his immediate family -- after his two daughters and wife -- to be questioned by authorities over a string of allegations of wrongdoing. His charges include alleged embezzlement of company funds and tax evasion on inheritance assets. The prosecution’s questioning of Cho comes after the National Tax Service filed a complaint accusing Cho and his sister Cho Hyeon-sook of avoiding inheritance tax amounting to some 50 billion won ($50 million) when their late father, Hanjin Group founder Cho Joong-hoon, handed them his overseas assets. Cho Yang-ho is also suspected of embezzling over 20 billion won of company funds and having caused losses to the company by allocating contracts to certain companies controlled by family members. He is also accused of having earned unfair profits via intra-group transactions that benefitted the owner family. Earlier this year, his wife Lee Myung-hee and two daughters, Cho Hyun-ah and Cho Hyun-min, were called in by the prosecution over different allegations spanning from assault to smuggling luxury goods and illegal hiring of foreign housekeeper. Multiple rounds of search and seizure have already taken place at their home, the Korean Air headquarters and offices of the group’s affiliates. Their allegedly abusive behaviors have evoked public uproar, triggering candlelight vigil rallies by employees to call for the ouster of the owner family. Some consumers have begun boycotting the brand. This is Cho’s third time to be questioned by the prosecution. In September 2015, he was investigated by the Seoul Southern District Prosecutors’ Office on allegations that he received favors from a politician. In September last year, Cho was questioned by the police on charges of appropriating company funds to finance his residence construction. In 2014, Cho had bowed in front of reporters, apologizing over the infamous “nut-rage” incident involving his older daughter Cho Hyun-ah. She was jailed for five months for ordering a Korean Air plane to return to the gate at a New York airport over “poor” inflight service. The Korean Air crisis this year was sparked in March, when his youngest daughter Cho Hyun-min was embroiled in another misconduct scandal. She allegedly yelled and threw a cup of water at an advertising agency manager during a meeting. Ten days later, Chairman Cho released a public apology over his daughter’s unruly behavior. He also fired both of his daughters form executive positions at Korean Air, vowing to reform the company’s structure by bringing an outside business expert to the executive position. Despite the actions, the case led to a number of whistleblowing and multiple investigations into the chairman’s family and their alleged abuse of power that had reportedly been going on for years. The Cho family’s woes continued to weigh heavily on Hanjin stocks. On Thursday afternoon, stocks of Korean Air tumbled by 3.3 percent to 27,100 won, while Hanjin Transportation plunged 1.6 percent to 21,050 won. Hanjin Group was founded in 1945, mainly doing business to provide transportation of materials to Korea and Vietnam. In 1990, Hanjin branched out into truck and warehouse sectors and launched Hanjin Express two years later. After Cho’s father, the Hanjin Group founder, died in 2002, he inherited the group’s Korean Air, while his younger brother Soo-ho was handed Hanjin Shipping. In 2014, Korean Air acquired 33.2 percent of Hanjin Shipping stocks, but the company filed for bankruptcy in 2016.